Contrary to wildly popular belief, there never has in recorded history been a society which operated strictly on barter. That’s a lie told by most economists and economic professors. Money on the other hand, is a different story. Feels as if there’s no way to get away from the stuff. Money = religion. Yet money is not natural law. It’s not like gravity or the conservation of mass or energy. In every case, it is a man-made creation. It is not necessary to run societies. Yet it controls us: we spend most of our waking hours working for it. We can, and we will, give up our money dependence as soon as practical alternatives are discovered and we release our religious believe in it. BitCoin shows people are thinking about alternatives. Before long, we’ll kick money to the curb in favor of a better way. Ending money’s rule necessitates opening hearts. 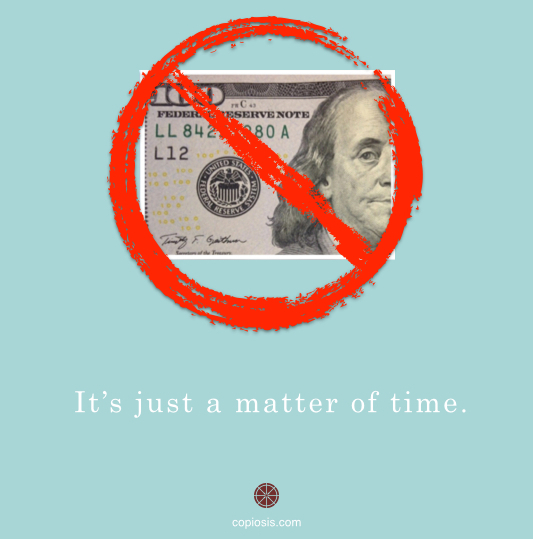 We don’t hang on to our money dependency for how great it is, though it does seem that way. We do so because we have no alternative. We = the 99.9 percent. We have no alternative because the .1 percent prefers it that way. It’s their chief means of control. That, and our compliance. Be prepared, several practical alternatives are coming. You’ll know them when you see them. But I don’t care about that. I don’t mind putting my faith in the universe to deliver to me what I need, as and when I might need it. It’s a rough ride, but I have faith in where it’s taking me. I’ve been quite interested in learning more about the gift economy for many years. As a freelance web developer for the past few years, I recently decided to offer my services completely for free or in return for donations in whatever amount clients wish to make. It’s interesting how confusing this “freely give; freely receive” principle of doing business is to so many of us. But we can each play our role in seeing it realized. Congratulations on being part of the shift. How have the results of your efforts been? « Don’t be shy, say hi.